There is nothing quite like the taste of homemade cornbread straight from the oven. A longtime Southern staple, a good cornbread recipe will save you in a pinch, and its purposes are endless. Did guests unexpectedly pop in? Bake it up, and serve with honey or jam. Do you need to bring a side dish to the upcoming holiday dinner? 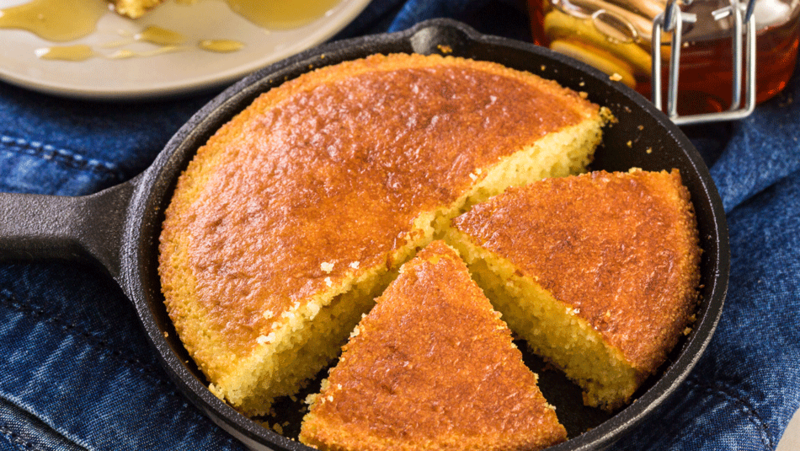 This Buttermilk Cornbread Skillet will disappear from the table in minutes. Made in a true Southern style from Camellia Beans, a beloved New Orleans brand, yellow cornmeal comes together with whole buttermilk to create a deliciously crumbly cast iron skillet recipe. So grab your handy 10-inch cast iron skillet, and let's get to baking. As always, you'll want to combine the dry ingredients together in a large bowl before adding the wet ingredients when beginning this skillet cornbread. When browning the butter in your cast iron pan, be sure that you have a hot skillet. The heat will give the bread a nice golden brown crust in the melted butter, typical of Southern cornbread. If you're making this for the holidays, you can make a double batch and use the second to make a stellar cornbread dressing, just like country star Thomas Rhett loves. Here are the ingredients you'll need, per Camellia's full recipe. To find the full recipe, head on over to Camellia.